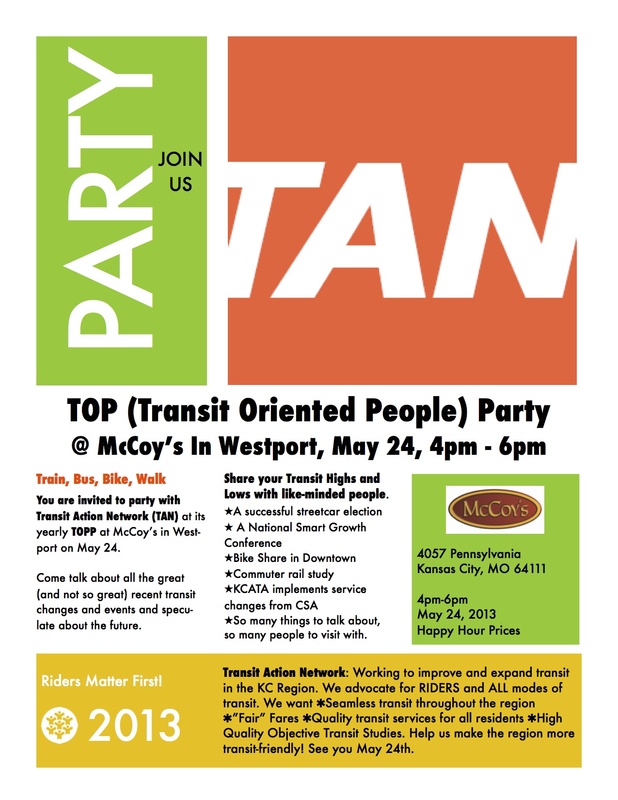 Join us Friday May 24th at McCoy’s in Westport from 4pm to 6pm for our TOPP. Download TOPP 2013 Invitation Feel free to print, post, share and forward this invitation to all your transit friends. Come share your year of transit memories with people who care about a quality comprehensive transit system for ALL riders and potential riders. Party with people whose vision of our region’s transit future improves ALL modes of transit. Help us create a more transit-friendly region! This entry was posted on May 9, 2013 at 8:22 AM	and is filed under Events. You can follow any responses to this entry through the RSS 2.0 feed. You can leave a response, or trackback from your own site.